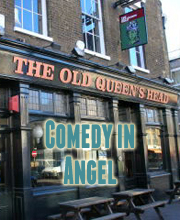 Laugh Out London presents an evening of Edinburgh Festival previews from two of our favourite comedians LUCY PORTER and SAM FLETCHER as part of the Laugh Out London Comedy Festival at the Old Queen’s Head in Angel. Please note, these are work-in-progress shows. TV panel show and Radio 4 regular who is maybe the most charming comedian in the country. She’s also a Celebrity Mastermind champion. Wow. A brand new stand-up show from the perennial Fringe favourite who’s also a regular on TV and radio (QI, Mock the Week, The News Quiz). Lucy’s festival shows are always sell-out hits and 2016 promises to be no exception. This is a heartfelt and hilarious hour of personal revelation and political observation. Lucy will cover some or all of the following: censorship, generational conflict, theological ethics, home-brewing, quizzing, Britpop of the 1990s, falconry and Gary Wilmot. Book early! ‘Impeccably punch lined anecdotes… Genuinely delightful’ **** (Telegraph). ‘A treat from start to finish’ ***** (Herald). “what I come to Edinburgh for….the fun of subversion and the pleasure of seeing a man more in control than he likes to let on” **** – Dominic Maxwell, The Times.